Heat grill to medium heat. Soak eight 6-inch wooden skewers in water for 15 minutes. Coat one side of a large piece of aluminum foil with cooking spray. Place beets and 3 Tbsp. of oil on foil; season with sea salt and pepper. Wrap foil over beets. Place beet packets on the grill; cook for 30 minutes or until beets are tender. Meanwhile, dip chicken tenders into 2 Tbsp. olive oil, then drench in Crunchmaster® Sea Salt Multi-Grain Crackers. 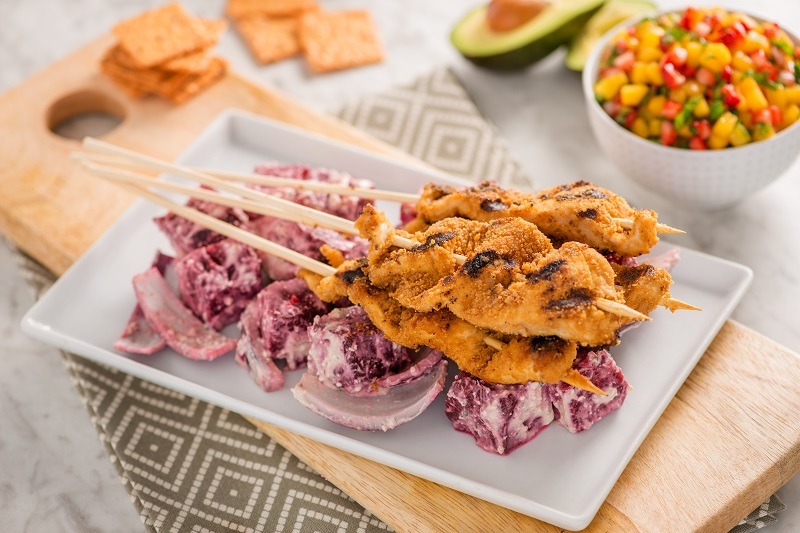 Place tenders onto soaked skewers; grill, turning occasionally, until chicken is cooked through, approximately 10-12 minutes. Meanwhile, in a food processor, blend feta, yogurt, mint, and balsamic vinegar until smooth. Remove beets from the grill; cut into 1 inch chunks; gently toss with feta mixture, red onion, sea salt and pepper. Transfer kebabs to a serving dish with prepared beets. Serve with a side of diced avocado with salsa.